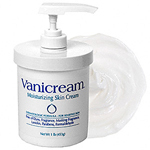 The Vanicream line takes the word vanity, and cream, and combines the two to make the word Vanicream. The word vanity usually has negative associations though, as this product should. It comes in many sizes, though the best bang for your buck would be the relatively huge 16 oz. or one pound tub of cream for the same price as other leading brands charge for half the amount. The only claims that the creators of this product saw fit to make were that it doesn’t contain harmful agents like formaldehyde and can be used on sensitive skin. This product contains no major active ingredients; mostly just glycerin based elements for moisturizing purposes as well as purified water as a base. The fact that it is not so good at dealing with eczema related symptoms should definitely put most people with a serious problem away from this product. It is used primarily as a lotion and just that, a lotion. This is all it is good for and nothing else should matter in that regard. It only mildly helps relieve itching and does not help at all to relieve the redness and swelling that occurs for people that seriously suffer from eczema or really bad skin conditions. This may help your skin stop feeling dry, but won’t get rid of the itch that causes the skin to become dry from all the scratching. This is a good product for people with dry skin, but if you have a real problem, you should look for something with a little more strength to it.